Everyone know that the exhaust of the Lamborghini Aventador is a truly hot flamethrower and so you should be careful where you rev the engine! 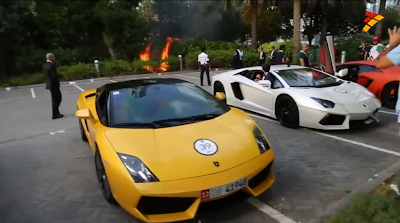 During a Lamborghini event held in Dubai to celebrate the 50th anniversary of the brand, a white Aventador caused a fire while revving very close to the bushes. Well, the exhaust spits flames, so it's obvious that you should pay attention and see what's behind you before revving it! hopefully a parking warden is standing behind it next .